Mossie Quinn bagged a brace of goals as Dublin ended Laois' Leinster championship fight with a 3-17 to 0-12 win at Croke Park this afternoon. Watched by a 67,970-strong crowd, the Dubs dominated proceedings to install themselves as red-hot favourites for the provincial decider, in which they will come up against Offaly or Wexford on July 16. 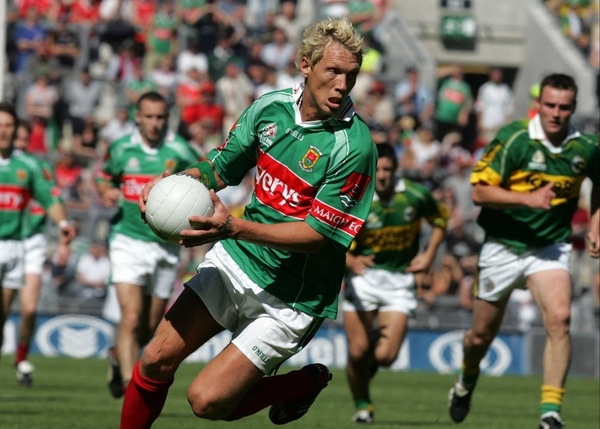 Quinn scored 2-03, Conal Keaney struck six points with Ray Cosgrove (1-03) also making a welcome return to headquarters – it was the 2002 All-Star’s first outing at Croke Park for three years. Laois were fighting a losing battle after a collarbone injury to big midfielder Padraig Clancy in the first half left them short-handed in centre-field. Brisbane Lions trialist Brendan Quigley was introduced but had little impact as Ciaran Whelan controlled matters superbly. Laois won the toss and opted to play against the breeze in the opening half, but points from Cosgrove and the ever-willing Keaney put them on the back foot immediately. Brian 'Beano' McDonald and Chris Conway brought it back to 0-02 apiece by the eleventh-minute and the Dubs were fortunate that a rampaging Clancy failed to find the net in the seventh-minute. Ross Munnelly and Paul Lawlor combined to put the Timahoe giant through on goal but he squeezed his shot to the left and wide. Donie Brennan struck over a fine point to put Laois in front, Keaney replied with a good catch and point and Munnelly fired over a free to put his side 0-04 to 0-03 ahead on 20 minutes. 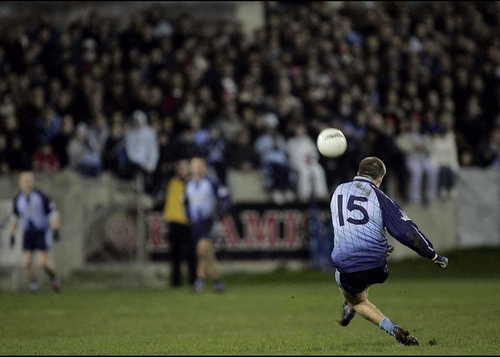 That was the last time Mick O’Dwyer's men were to hold an advantage as the Dubs took control for the remainder. A dangerous ball in from Cosgrove had the Laois defence stretched in the 22nd-minute and Jason Sherlock cleverly palmed the loose ball into Quinn's path for a slick finish to the right corner of Fergal Byron’s goal. With Clancy coming off moments later, holding his left shoulder, the signs were not good for last year's runners-up. McDonald and Munnelly did get them back to within a point at 0-06 to 1-04 down. However, two points from Keaney, who ended the half with 0-05 (2f), as well as efforts from Alan Brogan, Quinn (free) and Cosgrove, with a great individual point, sent the Dubs in at the break with a 1-09 to 0-06 buffer. Laois needed a bright start to the second half and they looked like they might get it when a fired-up Munnelly banged over his third point just 19 seconds into the fray. Yet the Metropolitans were always threatening and Brogan was unfortunate to have what looked a legitimate goal ruled out when Byron misjudged the flight of a Cullen through ball. Conway cut the gap to four points with a point on the run – although that was as close as Laois were to get. A Brogan point and two more from Quinn stretched the Dubs seven clear before Cosgrove sped onto a ball over the top and flicked it over the advancing Byron with his right fist to collect Dublin's second goal in the 51st-minute. There was no comeback for the midlanders from there on. McDonald took his tally to four points, dual player Darren Rooney and substitute Brian McCormack were also on target in the closing 20 minutes, but the Dubs were simply rampant and rightly enjoying themselves. With the Laois effort wilting, Keaney, Cosgrove, David O'Callaghan (0-02) and Paul Casey fired over points as the game took on a target practice feel. Quinn's second goal, right on 70 minutes, added a flattering gloss to the scoreline – substitute Mark Vaughan railroaded through and offloaded in time for Quinn to rip a right-footed shot to the roof of the Laois net - right in front of the raucous Hill 16 masses. Dublin looked a different team to the one that squeaked a result against Longford last time out – just which one will turn up on July 16 is anyone's guess. Dublin: S Cluxton; D Henry, B Cahill, P Griffin; P Casey (0-01), B Cullen (capt), C Goggins; C Whelan, S Ryan; C Keaney (0-06 (2f)), A Brogan (0-02), K Bonner; T Quinn (2-03 (2f)), R Cosgrove (1-03), J Sherlock. Laois: F Byron (capt); A Fennelly, C Ryan, P McMahon; D Rooney (0-01), T Kelly, J Higgins; P Clancy, N Garvan; R Munnelly (0-03 (2f)), C Conway (0-02), B Sheehan; D Brennan (0-01), P Lawlor, B McDonald (0-04).